A suspect in a hit-and-run accident that killed a cyclist in St. Louis last week surrendered to police this afternoon. Police have not yet released the name of the man, 27. The investigation is still ongoing, and no warrants have been issued. 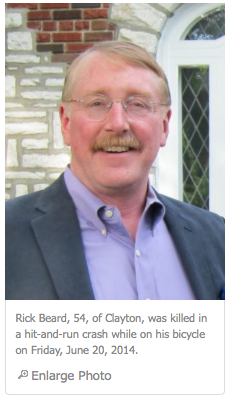 Last Friday night, Charles Richard “Rick” Beard, 54, of Clayton, was hit by a car while riding his bicycle north on Sarah Street toward Cook Avenue. The car’s driver sped away, and Beard was pronounced dead at the scene. Police found a maroon 2006 Pontiac Grand Prix near the accident scene and said at the time they believed it was involved in the crash. Video footage from a camera mounted on Beard’s bicycle showed that he rolled through a stop sign right before being struck, according to Police Chief Sam Dotson, though he said it wasn’t clear from the footage what caused the crash.